Nanotechnology refers to the branch of science and engineering dedicated to materials, having dimensions in the order of 100th of nm or less. The term being new, but has been widely used for the development of more efficient technology. In recent years, nanotechnology has been embraced by industrial sectors due to its applications in the field of electronic storage systems,  biotechnology,  magnetic separation and preconcentration of target analytes, targeted drug delivery, , and vehicles for gene and drug delivery. ,,, Consequently, with wide range of applications available, these particles have potential to make a significant impact to the society. Although new, the history of nanomaterials dates long back to 1959, when Richard P. Feynman, a physicist at Cal Tech, forecasted the advent of nanomaterials. In one of his class he said, "There is plenty of room at the bottom," and suggested that scaling down to nanolevel and starting from the bottom was the key to future technology and advancement. As the field of nanotechnology advanced, novel nanomaterials become apparent having different properties as compared to their larger counterparts. This difference in the physiochemical properties of nanomaterials can be attributed to their high surface-to-volume ratio. Due to these unique properties, they make excellent candidate for biomedical applications as variety of biological processes occur at nanometer scales. Over the year's nanoparticles such as magnetic nanoparticles (iron oxide), gold and silver nanoparticles, nanoshells, and nanocages have been continuously used and modified to enable their use as a diagnostic and therapeutic agent. Thus, in this particular review article we have introduced iron oxide, gold, and silver nanoparticles along with newer nanoshells and nanocages. These are then briefly discussed for their method of development and some citing recent examples which utilize their intrinsic properties as diagnostic and/or therapeutic agents for diseases, mainly cancer. Converging advances in the understanding of the molecular biology of various diseases recommended the need of homogeneous and targeted imaging probes along with a narrow size distribution in between 10 and 250 nm in diameter. Developing magnetic nanoparticles in this diameter range is a complex process and various chemical routes for their synthesis have been proposed. These methods include microemulsions, sol−gel syntheses, sonochemical reactions, hydrothermal reactions, hydrolysis and thermolysis of precursors, flow injection syntheses, and electrospray syntheses. ,,,,,, However, the most common method for the production of magnetite nanoparticles is the chemical coprecipitation technique of iron salts. ,,,, The main advantage of the coprecipitation process is that a large amount of nanoparticles can be synthesized but with limited control on size distribution. This is mainly due to that the kinetic factors are controlling the growth of the crystal. Thus the particulate magnetic contrast agents synthesized using these methods include ultrasmall particles of iron oxide (USPIO) (10-40 nm), small particles of iron oxide (SPIO) (60-150 nm). Besides, monocrystalline USPIOs are also called as monocrystalline iron oxide nanoparticles (MIONs), whereas MIONs when cross-linked with dextran they are called crosslinked iron oxide nanoparticles CLIO (10-30 nm). ,, The modification of the dextran coating by carboxylation leads to a shorter clearance half-life in blood. Hence, ferumoxytol (AMAG Pharmaceuticals), a carboxyalkylated polysaccharide coated iron oxide nanoparticle, is already described as a good first-pass contrast agent but uptake by macrophages is unspecific and too fast to enhance the uptake in macrophage-rich plaques. In order to improve the cellular uptake, these particles can be modified with a peculiar surface coating so that they can be easily conjugated to drugs, proteins, enzymes, antibodies, or nucleotides and can be directed to an organ, tissue, or tumor [Figure 1]. , While traditional contrast agents distribute rather nonspecifically, targeted molecular imaging probes based on iron oxide nanoparticles have been developed that specifically target body tissue or cells. , For instance, Conroy and coworkers developed (chlorotoxin (CTX)) a biocompatible iron oxide nanoprobe coated with poly(ethylene glycol) (PEG), which is capable of specifically targeting glioma tumors via the surface-bound targeting peptide. Further, MRI studies showed the preferential accumulation of the nanoprobe within gliomas. In another study, Apopa et al. engineered iron oxide nanoparticles that can induce an increase in cell permeability through the production of reactive oxygen species (ROS) and the stabilization of microtubules. These are the few applications of iron oxide nanoparticles in biomedical imaging. Figure 1 :Schematic diagram representing the fucntionalization of magnetic nanoparticles with bioresponsive peptide, PEG linker, chemotherapeutic agent, antibody, and cell-penetrating peptide. Colloidal gold, also known as gold nanoparticles, is a suspension (or colloid) of nanometer-sized particles of gold. The history of these colloidal solutions dates back to Roman times when they were used to stain glass for decorative purposes. However, the modern scientific evaluation of colloidal gold did not begin until Michael Faraday's work of the 1850s, when he observed that the colloidal gold solutions have properties that differ from the bulk gold. , Hence the colloidal solution is either an intense red color (for particles less than 100 nm) or a dirty yellowish color (for larger particles) as shown in [Figure 2] and [Figure 3]. , These interesting optical properties of these gold nanoparticles are due to their unique interaction with light. In the presence of the oscillating electromagnetic field of the light, the free electrons of the metal nanoparticles undergo an oscillation with respect to the metal lattice. ,,, This process is resonant at a particular frequency of the light and is termed the localized surface plasmon resonance (LSPR). After absorption, the surface plasmon decays radiatively resulting in light scattering or nonradiatively by converting the absorbed light into heat. Thus for gold nanospheres with particle size around 10 nm in diameter have a strong absorption maximum around 520 nm in aqueous solution due to their LSPR. These nanoshperes show a stokes shift with an increase in the nanosphere size due to the electromagnetic retardation in larger particles. Moreover, the use of gold nanorods as photothermal agents sets them apart from all nanoprobes. Photothermal therapy (PTT) is a procedure in which a photosensitizer is excited with specific band light (mainly IR). This activation brings the sensitizer to an excited state where it then releases vibrational energy in the form of heat. The heat is the actual method of therapy that kills the targeted cells. One of the biggest recent successes in photothermal therapy is the use of gold nanoparticles. Spherical gold nanoparticles absorptions have not been optimal for in vivo applications. This is because the peak absorptions have been limited to 520 nm for 10 nm diameter. Moreover, skin, tissues, and hemoglobin have a transmission window from 650 up to 900 nm. 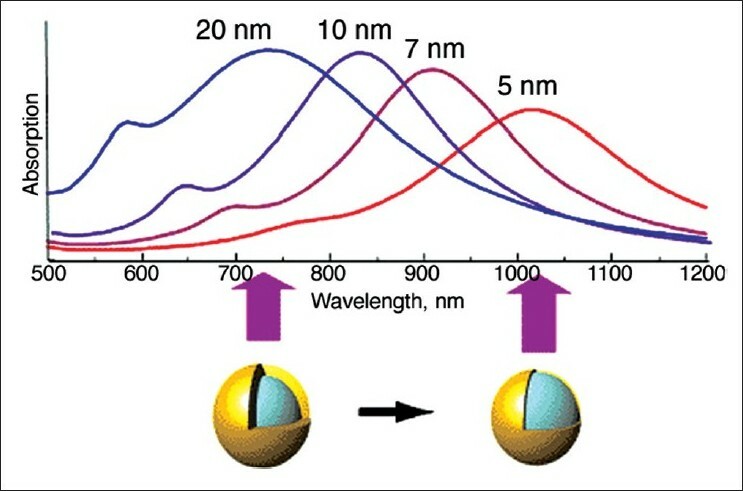 This was circumvented by the recent invention of gold nanorods by Murphy and Coworkers, who were able to tune the absorption peak of these nanoparticles, which can also be tuned from 550 nm up to 1 ΅m just by altering its aspect ratio of the nanorods [Figure 3]. , Hence, for the rod-shaped gold nanoparticles with the absorption in the IR region, when selectively accumulated in tumors when bathed in laser light (in the IR region), the surrounding tissue is barely warmed, but the nanorods convert light to heat, killing the malignant cells. This potential application of gold nanorods sanctifies them from other nanoprobes. However, their incompatibility with other high-resolution imaging techniques such as MRI and irreproducibility in shapes led to the invention of nanocages and nanoshells. Similar to gold nanoshells, gold nanocages represent a novel class of nanostructures that are hollow porous gold nanoparticles that absorb light in the near-infrared range. They were first developed by the Xia and Coworkers via the reaction of silver nanoparticles with chloroauric acid (HAuCI 4 ) in boiling water. Their LSPR peaks can also be tuned to the near infrared region by controlling the thickness and porosity of the walls. Comparable to nanoshells they have found applications in drug delivery and/or controlled drug release. Furthermore, the hollow interiors can host small objects such as magnetic nanoparticles to construct multifunctional hybrid nanostructures diagnostic imaging and therapy. Silver nanoparticles are the particles of silver, with particle size between 1 and 100 nm in size. While frequently described as being "silver" some are composed of a large percentage of silver oxide due to their large ratio of surface to bulk silver atoms. Like gold nanoparticles, ionic silver has a long history and was initially used to stain the glass for yellow. Currently, there is also an effort to incorporate silver nanoparticles into a wide range of medical devices, including bone cement, surgical instruments, surgical masks, etc. Moreover, it has also been shown that ionic silver, in the right quantities, is suitable in treating wounds. ,, In fact, silver nanoparticles are now replacing silver sulfadiazine as an effective agent in the treatment of wounds. Additionally, Samsung has created and marketed a material called Silver Nano, which includes silver nanoparticles on the surfaces of household appliances. Moreover, due to their attractive physiochemical properties these nanomaterials have received considerable attention in biomedical imaging using SERS. In fact, the surface plasmon resonance and large effective scattering cross-section of individual silver nanoparticles make them ideal candidates for molecular labeling. Thus many targeted silver oxide nanoprobes are currently being developed. Even though these particles are not as widely preferred as compared to the gold nanoparticles and nanoshells, but they have made a tremendous impact on today's era of medical science. The interesting property of the noble metals is a promise that they would be continuously used as newer applications and protocols are being developed. 2. Kang YS, Risbud S, Rabolt JF, Stroeve P. Synthesis and characterization of nanometer-size Fe3O4 and g-Fe2O3 Particles. Chem Mater 1996;8:2209-11. 3. Pankhurst QA, J Connolly, Jones SK, Dobson J. Applications of magnetic nanoparticles in biomedicine. J Phys D Appl Phys 2003;36:R167. 4. Dobson J. Gene therapy progress and prospects: magnetic nanoparticle-based gene delivery. Gene Ther 2006;13:283-7. 5. Rudge S, Peterson C, Vessely C, Koda J, Stevens S, Catterall L. Adsorption and desorption of chemotherapeutic drugs from a magnetically targeted carrier (MTC). J Control Release 2001;74:335-40. 6. Appenzeller T. The man who dared to think small. Science 1991;254:1300. 7. Mody VV, Nounou MI, Bikram M. Novel nanomedicine-based MRI contrast agents for gynecological malignancies. Adv Drug Deliv Rev 2009;61:795-807. 8. Praetorius NP, Mandal TK. Mandal, Engineered nanoparticles in cancer therapy. Recent Pat Drug Deliv Formul 2007;1:37-51. 9. Sharma P, Brown S, Walter G, Santra S, Moudgil B. Nanoparticles for bioimaging. Adv Colloid Interface Sci 2006;123-126:471-85. 10. Moghimi SM, Hunter AC, Murray JC. Nanomedicine: current status and future prospects. FASEB J 2005;19:311-30. 11. Morales MP, Bomati-Miguel O, de Alejo RP, Ruiz-Cabello J, Veintemillas-Verdaguer S, O'Grady K. Contrast agents for MRI based on iron oxide nanoparticles prepared by laser pyrolysis. J Magn Magn Mater 2003;266:102-9. 12. Babes L, Denizot B, Tanguy G, Le Jeune JJ, Jallet P. Synthesis of iron oxide nanoparticles used as MRI contrast agents: A Parametric Study. J Colloid Interface Sci 1999;212:474-82. 13. Yigit MV, Mazumdar D, Lu Y. MRI detection of thrombin with aptamer functionalized superparamagnetic iron oxide nanoparticles. Bioconjug Chem 2008;19:412-7. 14. Peng XH, Qian X, Mao H, Wang AY, Chen ZG, Nie S,. Targeted magnetic iron oxide nanoparticles for tumor imaging and therapy. Int J Nanomed 2008;3:311-21. 15. Chertok B, Moffat BA, David AE, Yu F, Bergemann C, Ross BD,. Iron oxide nanoparticles as a drug delivery vehicle for MRI monitored magnetic targeting of brain tumors. Biomaterials 2008;29:487-96. 16. Weimuller G, Zeisberger M, Krishnan KM. Size-dependant heating rates of iron oxide nanoparticles for magnetic fluid hyperthermia. J Magn Magn Mater 2009;321:1947-50. 17. Wei W, Xu C, Wu H. Magnetic iron oxide nanoparticles mediated gene therapy for breast cancer - an in vitro study. J Huazhong Univ Sci Technolog Med Sci 2006;26:728-30. 18. Elias A, Tsourkas A. Imaging circulating cells and lymphoid tissues with iron oxide nanoparticles. Hematology 2009;2009:720-6. 19. Moore A, Marecos E, Bogdanov A Jr, Weissleder R. Tumoral distribution of long-circulating dextran-coated iron oxide nanoparticles in a rodent model. Radiology 2000;214:568-74. 20. Kooi ME, Cappendijk VC, Cleutjens KB, Kessels AG, Kitslaar PJ, Borgers M,. Accumulation of ultrasmall superparamagnetic particles of iron oxide in human atherosclerotic plaques can be detected by in vivo magnetic resonance imaging. Circulation 2003;107:2453-8. 21. Hildebrandt N, Hermsdorf D, Signorell R, Schmitz SA, Diederichsena U. Superparamagnetic iron oxide nanoparticles functionalized with peptides by electrostatic interactions. ARKIVOC 2007;5:79-90. 22. Mahfouz AE, Hamm B, Taupitz M. Contrast agents for MR imaging of the liver: a clinical overview. Eur Radiol 1997;7:507-13. 23. Chin AB, Yaacob II. 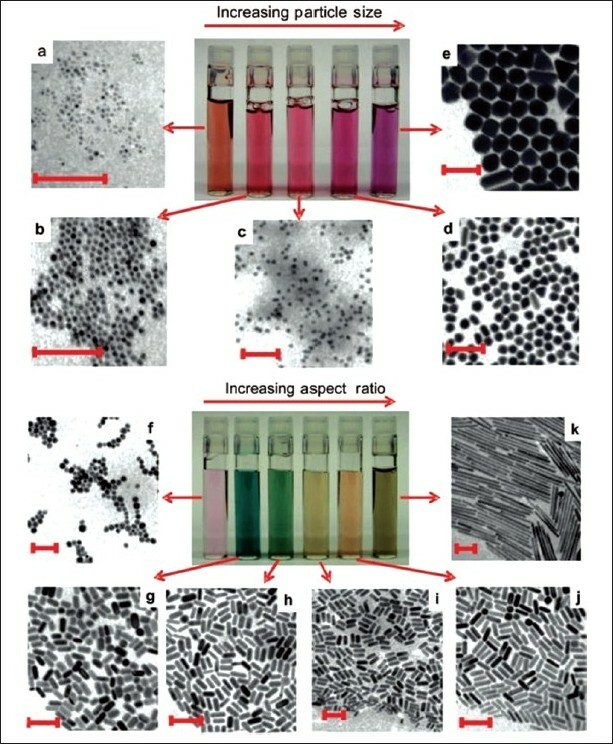 Synthesis and Characterization of magnetic Iron Oxide Nanoparticles via microemulsion and Massart's procedure J Mater Process Technol 2007;191:235. 24. Albornoz C, Jacobo SE., Preparation of a biocompatible magnetic film from an aqueous ferrofluid. J Magn Magn Mater 2006;305:12. 25. Kim EH, Lee HS, Kwak BK, Kim BK, Synthesis of ferrofluid with magnetic nanoparticles by sonochemical method for MRI contrast agent. J Magn Magn Mater 2005;289:328. 26. Wan J, Chen X, Wang Z, Yang X, Qian Y. A soft-template-assisted hydrothermal approach to single-crystal Fe 3 O 4 nanorods. J Cryst Growth 2005;276:571. 27. Kimata M, Nakagawa D, Hasegawa M. Preparation of monodisperse magnetic particles by hydrolysis of iron alkoxide. Powder Technol 2003;132:112. 28. Alvarez GS, Muhammed M, Zagorodni AA; Novel flow injection synthesis of iron oxide nanoparticles with narrow size distribution. Chem Eng Sci 2006;61:4625. 29. Basak S, Chen DR, Biswas P. Electrospray of ionic precursor solutions to synthesize iron oxide nanoparticles: Modified scaling law. Chem Eng Sci 2007;62:1263. 30. Martinez-Mera I, Espinosa ME, Perez-Hernandez R, Arenas-Alatorre. Synthesis of magnetite (Fe"3O"4) nanoparticles without surfactants at room temperature. J Mater Lett 2007;61:4447. 31. Morrison SA, Cahill CL, Carpenter EE, Calvin S, Harris VG. Atomic engineering of mixed ferrite and core-shell nanoparticles. J Nanosci Nanotechnol 2005;5:1323-44. 32. Sun S, Zeng H, Robinson DB, Raoux S, Rice PM, Wang SX, Li G. Monodisperse MFe2O4 (M = Fe, Co, Mn) nanoparticles. J Am Chem Soc 2004;126:273-9. 33. Qiu J, Yang R, Li M, Jiang N. Preparation and characterization of porous ultrafine Fe 2 O 3 particles. Mater Res Bull 2005;40:1968. 34. Lee SJ, Jeong JR, Shin SC, Kim JC, Kim JD. Synthesis and characterization of superparamagnetic maghemite nanoparticles prepared by coprecipitation technique. J Magn Magn Mater 2004;282:147. 35. Shen T, Weissleder R, Papisov M, Bogdanov A Jr, Brady TJ. Monocrystalline iron oxide nanocompounds (MION): physicochemical properties. Magn Reson Med 1993;29:599-604. 36. Weissleder R, Lee AS, Khaw BA, Shen T, Brady TJ. Antimyosin-labeled monocrystalline iron oxide allows detection of myocardial infarct: MR antibody imaging. Radiology 1992;182:381-5. 37. Montet X, Weissleder R, Josephson L. Imaging pancreatic cancer with a peptide-nanoparticle conjugate targeted to normal pancreas. Bioconjugate Chem 2006;17:905-11. 39. Chastellain M, Petri, A Gupta A, Rao KV, Hofmann H, Scalable synthesis of new class of polymer microrods by a liquid-liquid dispersion technique. Adv Eng Mater 2004;6:235. 40. Mazooz G, Mehlman T, Lai TS, Greenberg CS, Dewhirst MW, Neeman M. Development of magnetic resonance imaging contrast material for in vivo mapping of tissue transglutaminase activity. Cancer Res 2005;65:1369-75. 41. Sun C, Veiseh O, Gunn J, Fang C, Hansen S, Lee D, et al. In vivo MRI detection of gliomas by chlorotoxin-conjugated superparamagnetic nanoprobes. Small 2008;4:372-9. 42. Apopa PL, Qian Y, Shao R, Guo NL, Schwegler-Berry D, Pacurari M, et al. Iron oxide nanoparticles induce human microvascular endothelial cell permeability through reactive oxygen species production and microtubule remodeling. Part Fibre Toxicol 2009;6:1. 43. Pisanic TR 2nd, Blackwell JD, Shubayev VI, Fiρones RR, Jin S. Nanotoxicity of iron oxide nanoparticle internalization in growing neurons. Biomaterials 2007;28:2572-81. 44. Giljohann DA, Seferos DS, Daniel WL, Massich MD, Patel PC, Mirkin CA. Gold nanoparticles for biology and medicine. Angew Chem Int Ed Engl 2010;49:3280-94. 45. Peter PE, Meurig JT. Fein verteiltes Gold - Faradays Beitrag zu den heutigen Nanowissenschaften13. Angewandte Chemie 2007;119:5576-82. 46. Hayat MA. Colloidal gold: principles, methods, and applications. San Diego: Academic Press; 1989. 47. Murphy CJ, Gole AM, Stone JW, Sisco PN, Alkilany AM, Goldsmith EC, et al. Gold nanoparticles in biology: beyond toxicity to cellular imaging. Acc Chem Res 2008;41:1721-30. 48. Tong L, Wei Q, Wei A, Cheng JX. Gold nanorods as contrast agents for biological imaging: optical properties, surface conjugation and photothermal effects. Photochem Photobiol 2009;85:21-32. 49. Jain PK, Huang X, El-Sayed IH, El-Sayed MA. Noble metals on the nanoscale: optical and photothermal properties and some applications in imaging, sensing, biology, and medicine. Acc Chem Res 2008;41:1578-86. 50. Jain PK, Lee KS, El-Sayed IH, El-Sayed MA. Calculated absorption and scattering properties of gold nanoparticles of different size, shape, and composition: applications in biological imaging and biomedicine. J Phys Chem B 2006;110:7238-48. 51. Kelly KL, Coronado E, Zhao LL, Schatz GC. The optical properties of metal nanoparticles: the influence of size, shape, and dielectric environment. J Phys Chem B 2002;107:668-77. 52. Kreibig U, Vollmer M. Optical Properties of Metal Clusters. Springer Series Materials Sci 1995. p. 25. 53. Link S, El-Sayed MA. Optical properties and ultrafast dynamics of metallic nanocrystals. Annu Rev Phys Chem 2003;54:331-66. 54. Murphy CJ, Sau TK, Gole AM, Orendorff CJ, Gao J, Gou L, et al. Anisotropic metal nanoparticles: Synthesis, assembly, and optical applications. J Phys Chem B 2005;109:13857-70. 55. Link S, Mohamed MB, El-Sayed MA. Simulation of the optical absorption spectra of a gold nanorods as a function of their aspect ratio and the effect of the medium dielectric constant. J Phys Chem B 1999;103:3073. 56. Sharma V, Park K, Srinivasarao M. Colloidal dispersion of gold nanorods: Historical background, optical properties, seed-mediated synthesis, shape separation and self-assembly. Mater Sci Eng R Rep 2009;65:1-38. 57. Rao RC, Kulkarni GU, Thomas JP, Edwards PP. Metal nanoparticles and their assemblies. Chem Soc Rev 2000;29:27-35. 58. Daniel MC, Astruc D. Gold nanoparticles: assembly, supramolecular chemistry, quantum-size-related properties, and applications toward biology, catalysis, and nanotechnology. Chem Rev 2004;104:293-346. 59. Turkevich J, Stevenson PC, Hillier J. A study of the nucleation and growth processes in the synthesis of colloidal gold. Discuss Faraday Soc 1951;11:55-75. 60. Kimling J, Maier M, Okenve B, Kotaidis V, Ballot H, Plech A. turkevich method for gold nanoparticle synthesis revisited. J Phys Chem B 2006;110:15700-7. 61. Frens G. Particle size and sol stability in metal colloids. Colloid Polym Sci 1972;250:736-41. 62. Frens G. Controlled nulceation for regulation of particle size in monodisperse gold suspensions. Na Phys Sci 1973;241:20-2. 63. Brown KR, Natan MJ. Hydroxylamine seeding of colloidal Au nanoparticles in solution and on surfaces. Langmuir 1998;14:726-8. 64. Jana NR, Gearheart L, Murphy CJ. Seed-mediated growth approach for shape-controlled synthesis of spheroidal and rod-like gold nanoparticles using a surfactant template. Adv Mater 2001;13:1389-93. 65. Jana NR, Gearheart L, Murphy CJ. Wet chemical synthesis of high aspect ratio cylindrical gold nanorods. J Phys Chem B 2001;105:4065-7. 66. Subrata K, Sudipa P, Snigdhamayee P, Soumen B, Sujit KG, Anjali P, et al. Anisotropic growth of gold clusters to gold nanocubes under UV irradiation. Nanotechnology 2007;18:075712. 67. Alivisatos AP, Johnsson KP, Peng X, Wilson TE, Loweth CJ, Bruchez MP Jr. Organization of 'nanocrystal molecules' using DNA. Nature 1996;382:609-11. 68. El-Sayed IH, Huang X, El-Sayed MA. Surface plasmon resonance scattering and absorption of anti-EGFR antibody conjugated gold nanoparticles in cancer diagnostics: applications in oral cancer. Nano Lett 2005;5:829. 69. Kang B, Mackey MA, El-Sayed MA. 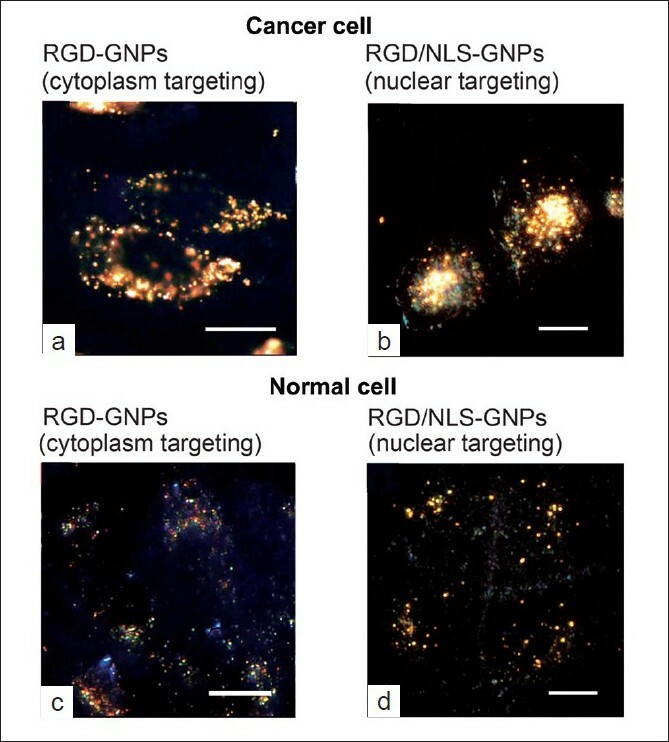 Nuclear targeting of gold nanoparticles in cancer cells induces DNA damage, causing cytokinesis arrest and apoptosis. J Am Chem Soc 2010;132:1517-9. 70. Gao H, Shi W, Freund LB. Mechanics of receptor-mediated endocytosis. Proc Natl Acad Sci U S A 2005;102:9469-74. 71. Nakielny S, Dreyfuss G. Transport of Proteins and RNAs in and out of the nucleus. Cell 1999;99:677-90. 72. Xue H, Atakilit A, Zhu W, Li X, Ramos DM, Pytela R. Role of the [alpha]v[beta]6 integrin in human oral squamous cell carcinoma growth in vivo and in vitro. Biochem Biophys Res Commun 2001;288:610-8. 73. Qian X, Peng XH, Ansari DO, Yin-Goen Q, Chen GZ, Shin DM, et al. In vivo tumor targeting and spectroscopic detection with surface-enhanced Raman nanoparticle tags. Nat Biotechnol 2008;26:83-90. 74. Busbee BD, Obare SO, Murphy CJ. An improved synthesis of high-aspect-ratio gold nanorods. Adv Mater 2003;15:414-6. 75. Neeves AE, Birnboim MH. Composite structures for the enhancement of nonlinear-optical susceptibility. J Opt Soc Am B 1989;6:787-96. 76. Oldenburg SJ, Averitt RD, Westcott SL, Halas NJ. Nanoengineering of optical resonances. Chem Phys Lett 1998;288:243-7. 77. Prodan E, Lee A, Nordlander P. The effect of a dielectric core and embedding medium on the polarizability of metallic nanoshells. Chem Phys Lett 2002;360:325-32. 78. Hirsch LR, Stafford RJ, Bankson JA, Sershen SR, Rivera B, Price RE, et al. Nanoshell-mediated near-infrared thermal therapy of tumors under magnetic resonance guidance. Proc Natl Acad Sci U S A 2003;100:13549-54. 79. Brongersma ML. Nanoscale photonics: Nanoshells: gifts in a gold wrapper. Nat Mater 2003;2:296-7. 80. Kim J, Park S, Lee JE, Jin SM, Lee JH, Lee IS, et al. Designed fabrication of multifunctional magnetic gold nanoshells and their application to magnetic resonance imaging and photothermal therapy. Angew Chem Int Ed Engl 2006;45:7754-8. 81. Chen J, Saeki F, Wiley BJ, Cang H, Cobb MJ, Li ZY, et al. Gold nanocages: bioconjugation and their potential use as optical imaging contrast agents. Nano Letters 2005;5:473-7. 82. Qin Y. Silver-containing alginate fibres and dressings. Int Wound J 2005;2:172-6. 83. Atiyeh BS, Costagliola M, Hayek SN, Dibo SA. Effect of silver on burn wound infection control and healing: review of the literature. Burns 2007;33:139-48. 84. Lansdown AB. Silver in health care: antimicrobial effects and safety in use. Curr Probl Dermatol 2006;33:17-34. 85. Schultz S, Smith DR, Mock JJ, Schultz DA. 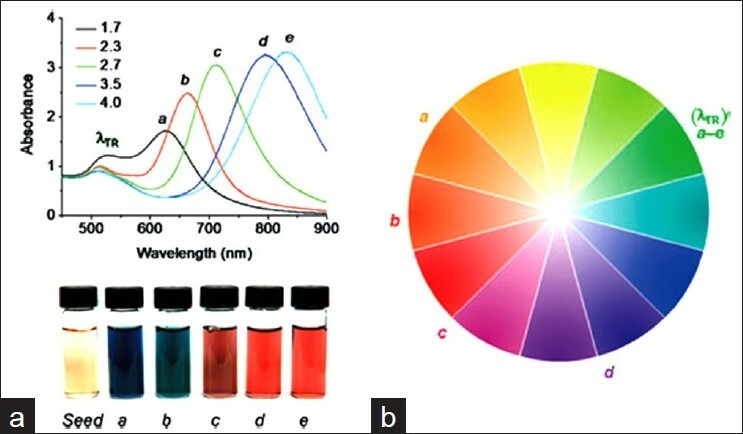 Single-target molecule detection with nonbleaching multicolor optical immunolabels. Proc Natl Acad Sci U S A 2000;97:996-1001. 86. Stepanov AL, Popok VN, Hole DE. Formation of Metallic Nanoparticles in Silicate Glass through Ion Implantation. Glass Phy Chem 2002;28:90-5. 87. Elechiguerra JL, Burt JL, Morones JR, Camacho-Bragado A, Gao X, Lara HH, et al. Interaction of silver nanoparticles with HIV-1. J Nanobiotechnoly 2005;3:6. 88. Furno F, Morley KS, Wong B, Sharp BL, Arnold PL, Howdle SM, et al. Silver nanoparticles and polymeric medical devices: a new approach to prevention of infection? J Antimicrob Chemother. 2004;54:1019-24. 89. Evanoff DD Jr, Chumanov G. Synthesis and optical properties of silver nanoparticles and arrays. Chemphyschem 2005;6:1221-31. 90. Laurent S, Forge D, Port M, Roch A, Robic C, Vander Elst L, et al.Magnetic iron oxide nanoparticles: synthesis, stabilization, vectorization, physicochemical characterizations, and biological applications. Chem Rev 2008;108:2064-110. 46 Biological activities of silver nanoparticles from Nothapodytes nimmoniana (Graham) Mabb. Fruit extracts. 68 Does surface coating of metallic nanoparticles modulate their interference with in vitro assays? 78 Antibacterial and cytotoxic potential of silver nanoparticles synthesized using latex of Calotropis gigantea L.